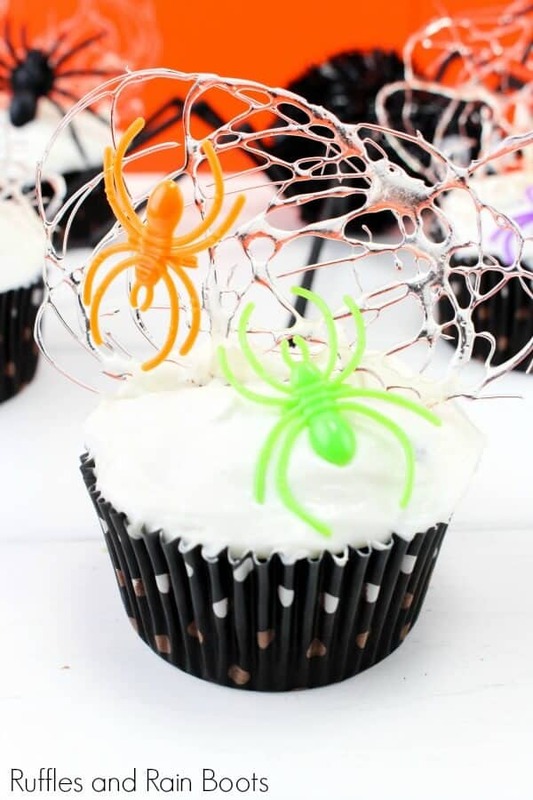 You are here: Home / Food / Spun Sugar Spider Web Cupcakes – A Fun Halloween Treat! 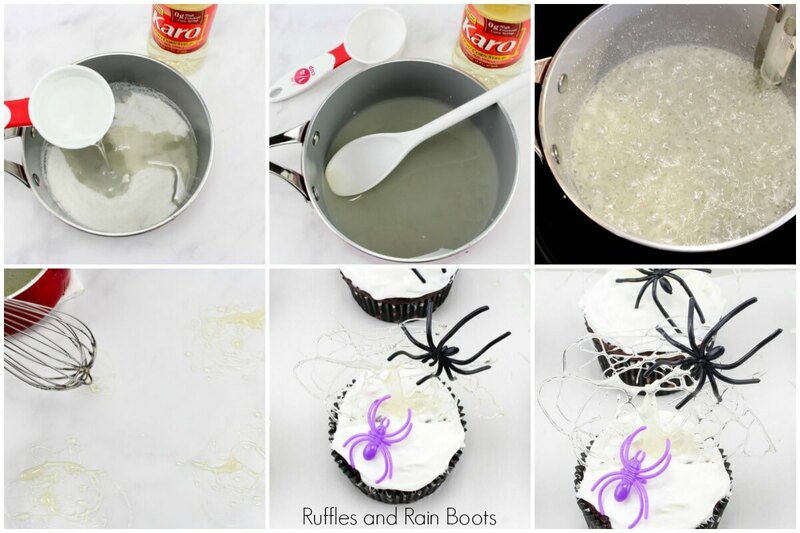 Spun Sugar Spider Web Cupcakes – A Fun Halloween Treat! 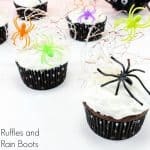 These spun sugar spider web cupcakes make a fun Halloween treat and even come with a party favor. Let’s get started with this easy Halloween dessert. We’re no stranger to Halloween crafts and food here on Ruffles and Rain Boots. Heck, we’ve shared our fair share of Halloween cupcakes like these Frankenstein cupcakes and these adorable ghost cupcakes. But friends, these spun sugar spider cupcakes are wow-worthy treats! Just look at them – and the kids get a toy, so really it’s a win-win. So about the sugar… There are a couple of ways to make it but I’m sharing the safe way. Although these look fun for the kids to do, I don’t actually recommend getting the kids in the kitchen for this recipe. 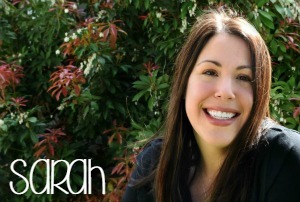 There are a few things you’ll need to prep before we get started. 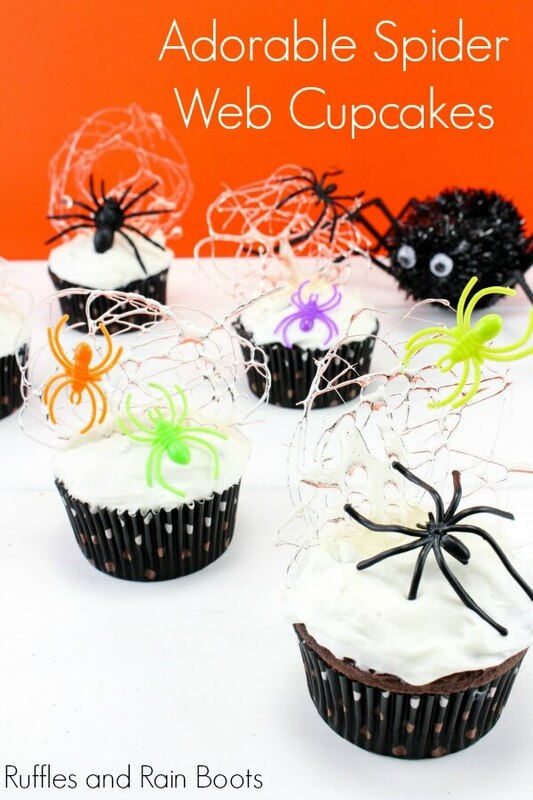 The sugar cools quickly so you’ll need to work quickly to create these oh-so-amazing sugar spun spider web cupcakes. When working with sugar, you should have a candy thermometer. You can try and guess at the ‘stages of sugar,’ but if you want to only do this once, get one. If you have Amazon prime, it can be to you tomorrow! I have this candy thermometer and it’s only my second so I can’t tell you it’s the “best,” but I can tell you it works. You’ll also need a whisk to avoid sticking your hands anywhere near hot sugar. Important, yes? Yes. Before you start, lay down some parchment paper on a cookie sheet. You will be building the spun sugar spider webs on this and because you need to work quickly, prep it ahead of time. Plastic spiders are EVERYWHERE during the spooky Halloween season, but we also found spider rings on Amazon. Grab a pack of spider rings and you’ll be able to use these Halloween cupcakes as party favors, too! 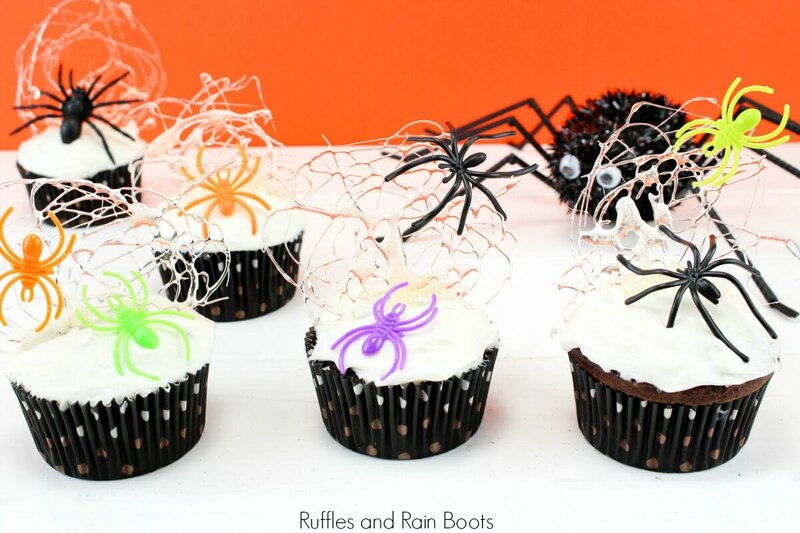 These fun spun sugar spider web cupcakes are fun to make and even more fun to eat! Use small spider rings and you'll have a dessert and party favor. In a small saucepan, add sugar, corn syrup, and water and stir to completely incorporate. Place a candy thermometer on the side of the pan. Bring the mixture to a boil over medium to medium-high heat. Stir constantly until it boils. Once the mixture boils, stop stirring and let it boil for 6-7 minutes or until the candy thermometer reads 280 degrees (F). Remove the pan from the stove. Dip a whisk into the mixture and move it in small circles over a parchment-covered baking sheet. Work quickly as the mixture will cool quickly. Make twice as many as you need because some might break. Let the spider webs cool while you frost the cupcakes. Use a flat-backed knife to create a space in the frosting and gently place the web into it. Add on the spiders and enjoy! If you want to join the fun here on Ruffles and Rain Boots, sign up for the once-weekly newsletter. I’ll share freebies and anything new and you’ll be the first to get them all. And if you make these, be sure to upload a picture to this Pin. Speaking of pins, your shares are how we grow and we are sincerely grateful.